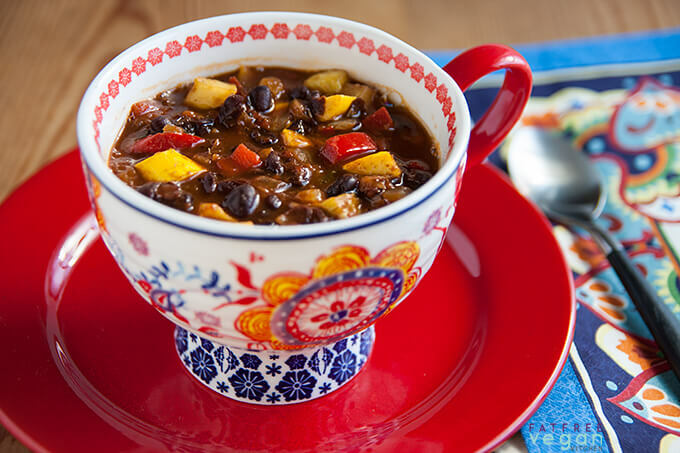 Thicker than a soup, thinner than a chili, and probably most like a stew, this unique dish combines black beans and pineapple with delicious results. I was sitting here at my desk one day thinking how much I like salsa with pineapple in it (because that’s the kind of deep thinking I do), when it occurred to me that what’s good in salsa should be good in soup. Black bean soup. So I tried it. And you know what? I was right. If you balk at having fruit in your soup, let me tell you that there was a time when I couldn’t imagine something sweet ever touching my savory. But that was before I opened my palate to the sensations of pineapple mingling with peanuts and kale or cumin-grilled tofu heaped with papaya salsa. Now I’m a believer. 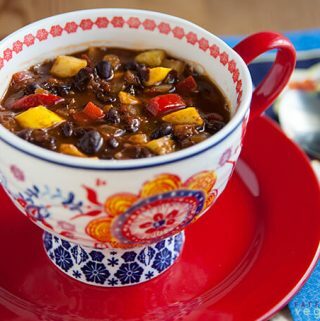 But even if you absolutely know that you don’t like fruit in your main dish, give this unique black bean pineapple soup a try. The pineapple lends such a subtly sweet flavor that my family didn’t even notice it until I pointed it out. But by then, they’d both finished two bowls, even daughter E, who doesn’t like black beans. Here are a few other savory dishes that contain fruit. 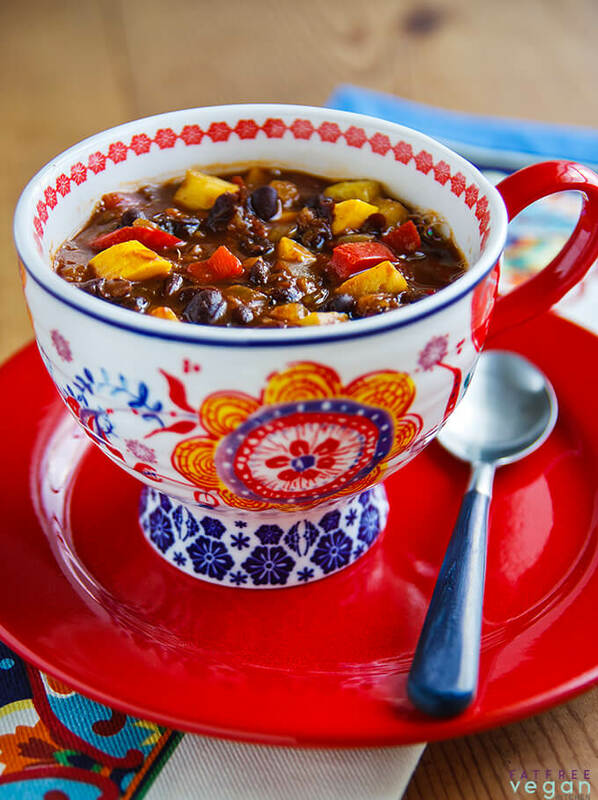 Add more broth to make this stew more like soup and less to make it more like chili. Or, use even less to make a thick filling for tacos or a dip for tortilla chips. Heat a non-stick pot. Add the onion and cook, stirring, until golden and beginning to brown (a pinch of baking soda will speed up this process). Add the bell pepper and jalapeno and cook until softened, about two minutes. Add the garlic, stir briefly, and then add tomatoes, beans, broth, and seasonings (but not squash or pineapple). Bring to a boil, then reduce heat and simmer for 15 minutes. Add the squash and pineapple, increase the heat a little, and cover. Simmer until squash is just tender. Check seasonings, adding more to taste, and serve. Thanks for the recipe! We made it last night, and it turned out great! I will definately be making it again. The only thing I would change is that I think I will use chunks of pineapple next time instead of crushed pineapple. I could taste the sweetness of the pineapple, but it would have been really satisfying and refreshing to bite into a whole piece while eating this. The taste combination really reminded me of living in South America, where I think the savory/sweet combo is more common than in the U.S. I may also try making the combo without as much liquid and serving it as a bean salad. Hello Susan. This recipe looks delicious and I am adding it to my menu for the week. I have a question though. The recipe states it serves 6. Is that a 1 cup serving or 1 1/2 cup, 2 cup, etc? Your input would be greatly appreciated! Thank you! Katrina, I just use the number of servings that I actually got when I made it to determine the servings, but I would guess that a serving is around 1 1/2 to 2 cups or a standard soup bowl full. I made this recipe for dinner last night, except that I pureed half of it before putting in the pineapple and zucchini becuase my husband hates bean texture. It was delicious, healthy and made a wonderful leftover lunch today too. Thanks! I’m going to try this, but I’m going to try it with peaches instead of pineapple. I LOVE me some peach salsa (more than I like pineapple salsa). Thanks for such a great idea! Wow, black bean and pineapple is an inspired combination indeed– it makes me think of Carribean cuisine. I’m excited to give this a try– I’m thinking it might look especially beautiful garnished with shredded coconut. Wow! We just had this and I love it. My 17 yo had two bowls, actually 1 1/2 because this soup is filling. My 14 yo didn’t like it, but right now he doesn’t like much of anything. I’m going to make a double or even triple batch and can these to eat when we get a hankering for the sweet and spicy taste. Yummy stew! I made it with mango and pumpkin instead of pineapple and squash, using what I had at hand. Thanks for the recipe! Looks so yum .I was wondering if I could make this in a crockpot?I have dry beans.At what stage do I add the pineapple and squash then? I would add them for the last hour of cooking. Give them enough time for the squash to cook but not fall apart. I used this as an inspiration point for a “clean out the fridge/freezer” chili I made last week — I subbed a crumbled package of tempeh and a chopped 8-oz packate of seitan (both from the far corners of the freezer) for the black beans (to appease someone who believes chili does not contain beans) and most of a jar of chopped roasted red peppers for the fresh. It was awesome, and the leftovers made a great chili-mac the next day, with a slightly-thickened cheezy sauce from your Easy Mac-n-Cheeze. Thanks for the idea! Just had this for dinner with brown rice. Fantastic. Thank again for another great meal. My only changes: Used frozen rather than fresh yellow squash, and used my freezer standby of the leftovers of a can of chipotle in adobo, chopped from frozen instead of the jalepenos and chipotle chile powder. It was perfect for me. My husband added a couple of Cholula Hot Sauce. The pineapple addition was inspired. I am not a pinapple fan and I loved it. (I used an 8 oz can of Pineapple tidbits in 100% juice). i have made this dish twice and its very good it got better each time i made this dish. By far the best soup i ever made. Did not add stock and substituted napa cabbage for zucchini as that. Is what i had on hand….simply stellar,you truly inspire me susan! This was very tasty! You could taste the pineapple, but if you didn’t know it was in there, you wouldn’t be able to say, “Hey, there is pineapple in my chili!” Gets better leftover. I’ve made this several times (again tonight) and it is FABULOUS!! I can’t get enough of pineapple, which makes me love it even more. Thanks for the recipe! This was the first recipe I made from this website and it was definitely a winner! The pineapple was such a delicious surprising touch. I can’t wait to explore the site some more and try out more of the recipes. Made it. Loved it. Didn’t have a whole pound of yellow squash or zucchini so I used my one yellow squash and one of my acorn squash cubed (just added it with the broth step). Did not have chipotle chile powder or Mexican oregano but it was delicious none the less. This will become a favorite for sure! Thank you! First time making a recipe from this website, It was very good 🙂 Very spicy but maybe cause I added 2 chipotle peppers and a litte adobe sauce. My husband loved it, cant wait to try more recipes ! I just made this today….YUM! I didn’t have any squash, so I doubled up on the peppers (can never get enough of those) and added some mushrooms instead. It is so good, I’m thinking about getting some more! Susan, I have only just stumbled across your blog while googling Eat to Live recipes, and let me say your recipes are incredible! I just made this one tonight, loved it, and will certainly be making many more. Well done! Love this recipe! I made it today in the middle of a heatwave, and even my meat lover husband enjoyed it. He kept saying “That smells great!” then actually put aside his bag of fast food to try some chili! It’s spicy with just a hint of sweetness. I made it in a hurry today – about 15 minutes – now I can’t wait to try the leftovers after they’ve simmered a little longer. What a wonderful looking bowl of stew. Looking forward to trying it. It looks especially good in that exquisite cup/bowl. Susan, hello and THANK-YOU! I am new to this cooking, certainly new to finding recipes online, and this is MY first time leaving a blog comment. I wanted to tell you that I made this and it was AMAZING!!!! I am so excited to think I can actually cook! I am a Paleo girl that is conflicted. Do you know Paleo? Anyway, Paleo or not, this was amazing and a keeper. Thank you for this! I needed a dish for a party today. The event was a celebration of a friend who has lost 116 pounds!!! So, I needed something very healthy and also buffet-friendly. Rather than make it a soup/stew/chili, then, I omitted the vegetable broth and the only liquid I added was the tomato juice from the canned tomatoes. I served it over rice with fresh cilantro and lime wedges. It looks so pretty and tastes even better. I would never have thought to put pineapple in a soup but I love all the ingredients in this one – It might be harder work convincing my husband to try it though! I just made this tonight 🙂 It is making the house smell awesome! I did add come sweet potatoe (I thought that it called for it but on a second look I think I mistook it for a different recipe..But still tastes Great!) Also instead of 2 cans of black beans I used one can of black and one can of mixed for variety 🙂 Thanks for the awesome recipe! This is the first recipe I’ve tried from here, and I absolutely love it. This will be a staple for me from now on! I don’t like canned pineapple, and the only ones available in my area have added sugar, so i just bought fresh, and mashed it in a bowl, which gave me plenty of juice. I love this, Thank-you! Made this for dinner last night and OH my goodness. Incredible! I will definitely be making this again. I just got back from Freddie’s, red pepper and zucchini in my hot little hands. I’m having this tonight. Instead of using chili powder, I’ve got two California and one Ancho dried chiles, I’m going to simmer those and blend them into a paste with a chipolte or two and use those instead of chili powder. LOVE this blog! You have made a huge difference in my life, and I am forever grateful! I’ve made this over and over, my sister even won a chili cook-off with it! Susan, thanks for this recipe! 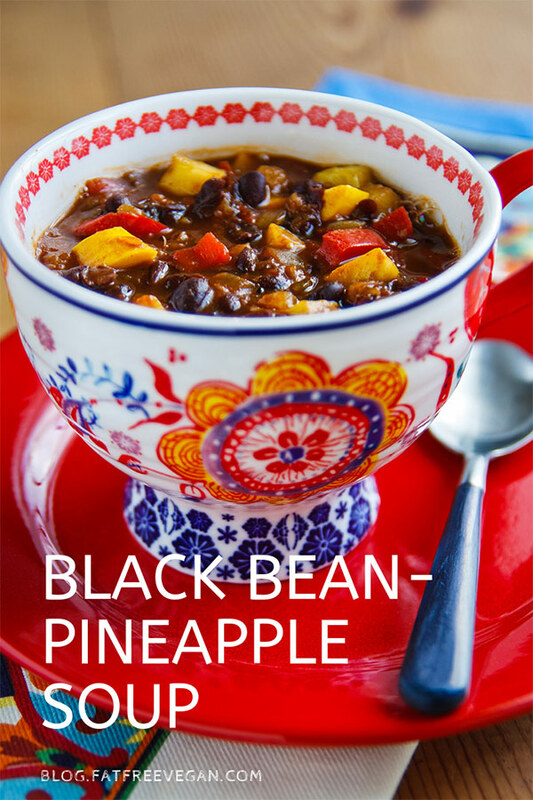 We finally made your Black Bean Pineapple Chili tonight, and it was a major hit with my family. Next time I might be inclined to include a few more beans in order to smash them in order to thicken the ‘soup’ into more of a ‘stew’ or ‘chili’, but the flavor was very, very nice (if I hadn’t looked at the picture on your page and *imagined* that it was thicker, I might not have cared, but I had my mind set on something thicker until I read the recipe more closely today…….). — Earlier in the week, I had made a pot of thick Jamaican black beans (seasoned with ginger, cumin, etc. ), serving them with Banana Salsa and Yellow Rice, and there were leftover beans from that meal. So I simply used those beans with my own spices already mixed in, thus I skipped your seasonings. Other than that, this looked like a straightforward soup to as my daughter to make up for the family. My daughter easily whipped up your soup by putting the onion, garlic, and etc. (all but the pineapple and beans) in a slow cooker throughout the day. Then she added the beans and pineapple at the end (that way the pineapple was still pretty and nice and juicy). I did have her use our black beans without rinsing them, but it was a flavorful liquid, not canned, which just made sense to me (FWIW). This time I served your chili with rice, garnished with green onions (oh, and my husband hasn’t given up his sour cream…. ), but next time I’ll probably try a Jamaican styled cornbread. Either way, it’s all good! Now I’m off to slip your recipe into the family cookbook! Thanks again for the bunches of yum!!! As is typical for spring in Boston, sunny and 70-degree weather teased us briefly and gave way to a couple days of cold and 4-6 inches of snow. This soup really hit the spot and chased away the winter blahs! Susan, your inspiration is soon to be my lunch delight. Thank you for this recipe. There are a couple of people who are loving this stew tonight. Thank you so much for this wonderful recipe. You keep knocking it out of the park and I’m getting a reputation as a great cook, thanks to you. I stumbled upon this recipe on Pinterest and it was absolutely delishious. There is just the right amount of heat and the flavor of the pineapple is perfect. I am craving it right now and cannot wait to make it again soon. I have a darling daughter-in-law who when I visit accommodates my eating stye with recipes from your site, Susan. She made this for me and sent me home with at least half the pot. I froze it and thawed it a week later. It tastes even better now than the first time. I’ve printed it up so I can make it regularly for myself. Thanks as always! My wonderful daughter-in-law makes me recipes from your site when I visit. She sent me home with nearly half the pot of this yummy stuff. I froze it and am enjoying it now–tastes better than it did the first time!